Set on the Detroit "holiday" of Devil's Night, the night before Halloween, The Crow chronicles the death and return of musician Eric Draven (Brandon Lee). Draven is killed with his fiance during the pre-Halloween mayhem, which here involves everything from arson to murder. He returns from the dead as the titular "Crow" exactly one year later to exact revenge on his murderers, who are led by Top Dollar (Michael Wincott) and Myca (Bai Ling). Not only are the crooks on edge as the Crow begins to terrorize them, but an honest cop (Ernie Hudson, Ghostbusters) and young girl, Sarah (Rochelle Davis), get caught in the plot. Though it's not a realistic depiction of crime in Detroit, or anywhere, and ignores many of the socioeconomic factors contributing to crime, The Crow nails a sense of melancholy in the wake of tragedy. This sense of tragedy and sadness permeates the film, indicated by everything from Draven's brooding persona and the non-stop rain. Narration by a minor character (Sarah), Draven's frequent flashbacks, and an ethereal score also add a certain dreamlike quality to the film. The unfortunate fact that star Brandon Lee died during the making of the film magnifies these effects. It's interesting that Draven, while ostensibly the hero, isn't particularly heroic. He murders, justifiably or not, his murderers in a gruesome manner. He's the id of Batman, Paul Kersey or Dirty Harry, characters who led with their id anyway. The film is heavily production designed and looks nothing like Detroit, but hey, if New York and Chicago can be fictionalized for a comic book so can we. The film synthesizes dozens of influences, taking story nods from the aforementioned Batman comics and Death Wish films and design inspiration from Blade Runner and expressionistic classics like 1931's Frankenstein and 1927's Metropolis, the original "future city" movie. There are probably a dozen other movies, comics and books that could be tied in as inspiration as well. 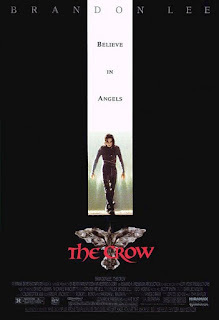 By nodding to all of these influences, The Crow hints at a collective movie unconscious, borrowing these familiar plots and designs yet making them different and new, further adding to the film's dreamlike quality. So while The Crow is not completely original, it's style and execution makes the familiar feel fresh, or at least fresh the context of the mid-90s. Director Alex Proyas would take these concepts and make city design an explicit plot point in his follow up film Dark City, which would make would make a great double feature with The Crow. The Crow also has a pretty cool heavy metal soundtrack, featuring Nine Inch Nails, Pantera, and Rage Against the Machine. Though it's not a scary Halloween film, The Crow's melancholy themes and strong production design make it something of a modern classic in both the goth and comic book genres. Perhaps The Crow is more All Souls' Day than Devil's Night.